Martina Marini Misterioso (Pescara, Italien) studierte an der Kunstakademie von Brera, Mailand und besucht nun die Akademie der bildenden Künste in München. Hauptaspekt ihrer Arbeit liegt auf dem Sammeln von Alltagsgegenständen und Erinnerungen, die sie mit repititativen Aktionen kombiniert. Das Konzept »Zuhause« ist allgegenwärtig. Ihre Performancerituale gestaltet sie aus Aspekten ihrer persönlichen Geschichte. Sie wird die Arbeit FINAL ACT zur Eröffnung der Magdalena München Saison zeigen. Martina Marini Misterioso is an artist who works with different media including performance. In her practice she investigates the nature of her needs. Time and repetition play a key role and the act of gathering is fundamental: everyday life leftovers and signs, seen as encounters, are rearranged in new orders of potentially always growing forms. The concept of “home” is all the time present and the connection with the natural world a con­tinuous inspiration. She sees performance as a powerful tool to put her body and actions in the service of some­thing that might not last long but that operates on multiple levels. Her performances often come from her personal history events and under the guise of some sort of ritual. Martina (Pescara, Italy) studied at the Art Academy of Brera, Milan, and of Munich where she’s still attending. She collaborates with other artists and in particular she’s part of a duo called “MarinA”. 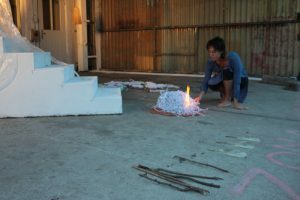 For few years she’s been co-curator of the “Break Through” space, a performance space in Mu­nich created by the performance artist Dorothea Seror. 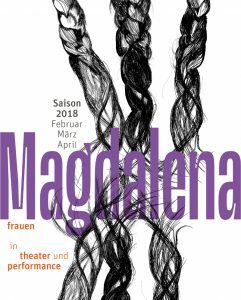 Martina will present a new performance, Final Act, at the opening of the Magdalena München Saison 2018.